Your Sabai Technology VPN router needs to have the most recent version of the Sabai OS installed. Firmware updates can be requested here. Please keep the VPN Accelerator well ventilated and away from heat sources. Overheating could cause the unit to malfunction. Connect a cable from the Ethernet port on the VPN Accelerator to a LAN port of the Sabai Technology VPN Router. Plug in the power to the accelerator. Check the USB thumb drive on the back of the VPN Accelerator and verify that it is firmly in place. Press the power button on the top of the VPN Accelerator. If you are adding the VPN Accelerator to a current Sabai router setup, please be sure to stop the VPN service in the router before you begin programming your Accelerator. The VPN will always connect from the VPN Accelerator. Click on Status/Device List. Find the device with the hostname vpna. 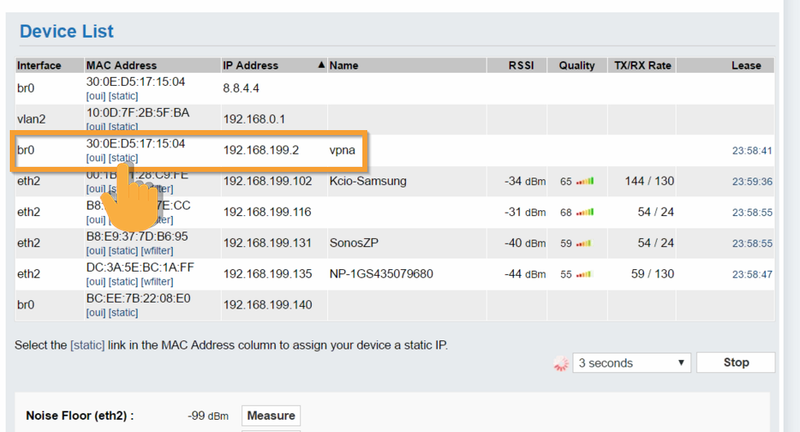 Check the IP address associated with that device. If it is not listed ast192.168.199.2 then click the Static button below the MAC address. On the new page, change the IP address of the new entry to end in a .2, click Add, then Save. Open a web browser and enter 192.168.199.2 in your browser address bar. The default login is admin and sabaipass123. Enter your Username and Password information in the provided boxes. Repeat this process to load a new file or VPN Server location. It is not necessary to clear the old file before you input a new file. Congrats! 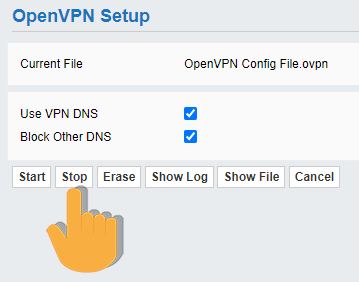 Your VPN Accelerator OpenVPN setup is complete. Congrats! Your VPNA PPTP setup is complete. Enter 192.168.199.1 in the address bar and log in to your Sabai VPN Router. The default login is admin and sabaipass123. Each device connected to your network will appear in the Gateway Setup list. Start by assigning your default setting. The Default setting indicates how any device added to your network will automatically connect. Accelerator automatically routes devices through your VPN Accelerator. Or you can manage each device manually with the radio buttons to the right of each device. reactivate the gateway and restart the accelerator. Check that the accelerator then has started the VPN and if not then go ahead and start it.